For Women’s History Month, we interviewed Dr. Georgia Lorenz, president of Seminole State College. Dr. Lorenz was previously vice president of Academic Affairs at Santa Monica College in California before becoming Seminole State’s third president on Aug. 1, 2018, succeeding Dr. E. Ann McGee who had successfully served the College for 22 years. Here are Dr. Lorenz’s thoughts on leadership! Our students inspire me the most. So many of our students have overcome great challenges to pursue their education and reach their goals. I am moved by their commitment, hard work, support of each other, and optimism. They motivate me to work harder. Their accomplishments serve as evidence that quality higher education and hard work are a powerful combination. 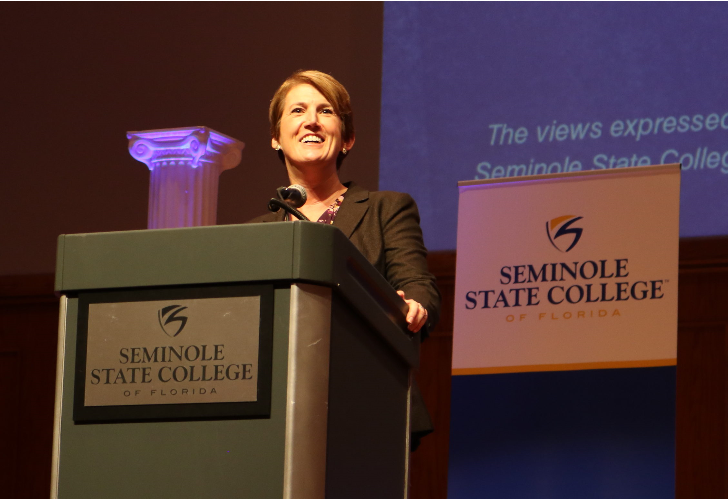 Becoming the president of Seminole State College is certainly my biggest professional achievement thus far. I am so proud and honored to have the opportunity to lead such an accomplished institution that has achieved so much for our students and the region. I know that I have big shoes to fill, succeeding Dr. E. Ann McGee who guided the institution to grow to 30,000 students and four campuses during her tenure. I will continue driving Seminole State College to the next level of excellence. Be your genuine self and bring your whole self to the work. And this means allowing yourself to be vulnerable in the work place, which can be uncomfortable. I am not sure anyone ever really sat down and explained this to me, but I have observed this behavior in those leaders I respect and admire the most. I remember this lesson particularly when I am in new situations and feeling tentative about how I might be perceived. I have never gone wrong by being true to myself, my values, and my commitments. Once a faculty member laughed at me and said, “I can’t believe how real you are with us.” I took that as a compliment. Treat every job and every assignment or project like an opportunity to grow and achieve. Looking back now, I can identify projects that were career-changing for me. I had no idea that would be the case at the time. If I had not treated those opportunities as moments to demonstrate my best work, I would not have experienced the same outcomes. About Seminole State College of Florida: Seminole State College of Florida, established in 1965, serves nearly 30,000 students across six sites in Central Florida and online. A comprehensive college, Seminole State has awarded more than 100,000 credentials, from bachelor's degrees to high school diplomas, and offers more than 200 degrees, certificates and programs designed for success. For more about the college, visit www.seminolestate.edu.